Families involved in the Healthy Start program report no abuse or neglect. Thirty women and children stay in our domestic violence shelters each night. Helping 4,100 people a year with addiction, depression and mental health issues. More than 2,700 homes have been saved from foreclosure in the last five years. For more than 76 years, Family Service of the Piedmont has been empowering individuals and families to restore hope, achieve stability and thrive through quality support services, advocacy and education. Family Service of the Piedmont is a private, not-for-profit agency focused on building safe and healthy families in the Piedmont Triad. 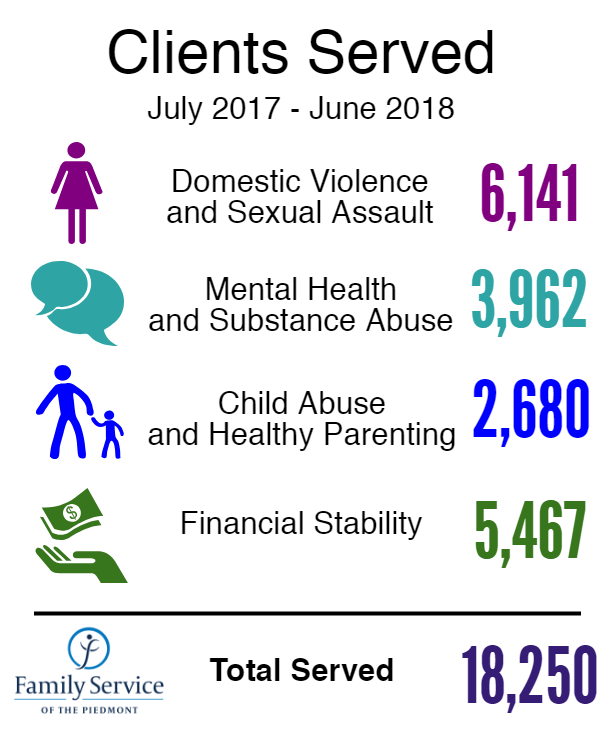 We serve more than 18,000 clients each year, addressing issues of domestic violence, child abuse, mental health and financial stability. There are many ways to support the work of Family Service of the Piedmont. Join one of our volunteer Guilds in Greensboro or High Point. Volunteer individually with our programs, or support our needs by collecting items from the agency Wish List. Get connected by attending one of our upcoming fundraising events. Become an individual event host or promote your company's community spirit by supporting Family Service as a corporate sponsor. Join us today, as we build safe and healthy families in our community.